Some of you may have heard of or be familiar with the low FODMAP eating plan. It is a scientifically-based eating plan used by people who need to trial a way of eating to manage their diagnosed lower bowel digestive issues. FODMAP stands for Fermentable, Oligosaccharides, Disaccharides, Monosaccharides And Polyols!! These are found in many foods and can be poorly absorbed from the intestine. As they travel through the bowel, the action of gut bacteria causes gas production, bloating, pain and altered bowel patterns in some people. Some of the FODMAP’s you may have heard of are lactose, fructose and perhaps sorbitol. Others are less well known and include names such as fructans, mannitol and galacto-oligosaccharides. I regularly see people with the symptoms described who have been diagnosed with Irritable Bowel Syndrome or other digestive disorders that research suggests benefit from a strict low FODMAP diet trial. If symptoms improve FODMAP tolerances are worked out over time to minimise restrictions. Low-FODMAPPERS always find compliance an issue as many of the traditional ingredients like onion and garlic can’t be used in cooking. 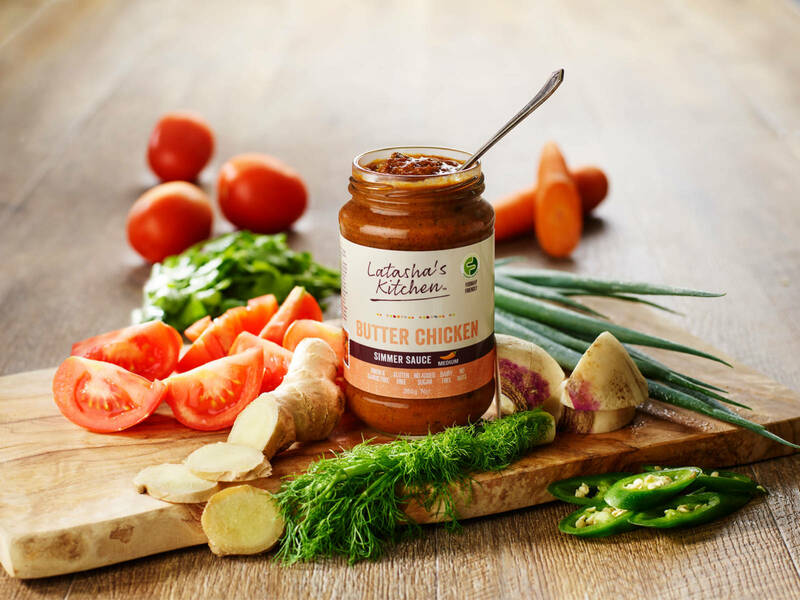 Latasha has come to the rescue and responded to requests for two flavoursome Low FODMAP Simmer Sauces for the digestively challenged. These are accredited with the FODMAP FRIENDLY FOOD PROGRAM which checks levels at their facility. Try my recipes that combine the low FODMAP simmers sauces with other low FODMAP ingredients. 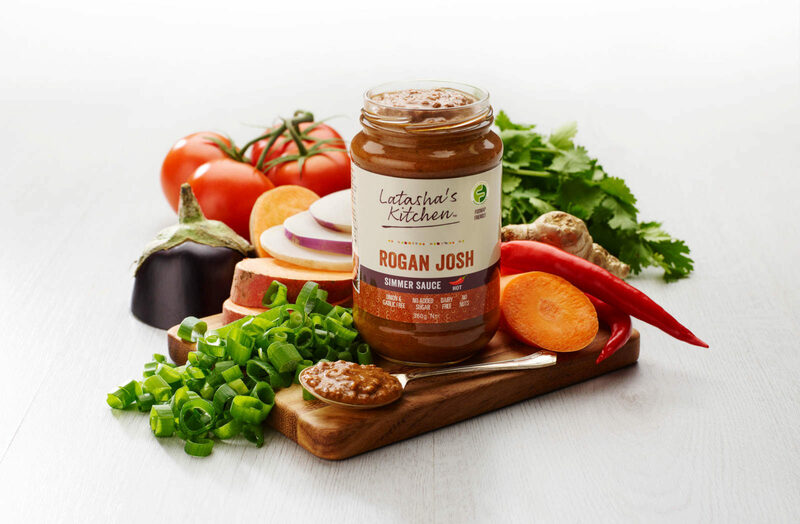 Lovers of spice will enjoy the spicy kick of the Rogan Josh simmer sauce. You can reduce the kick by using half a jar and mixing it with lactose-free yoghurt or some coconut milk. There’s Roast Vegetables with Low FODMAP Drizzle Sauce, Low FODMAP Rogan Josh Spicy Tofu Bake and Low FODMAP Spicy Fish Curry. 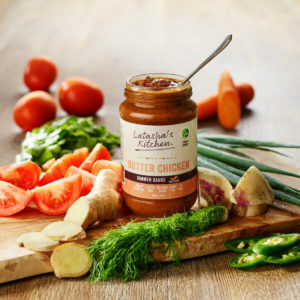 The Butter Chicken sauce is medium in heat level which many will enjoy adding to their preferred vegetables and meats or vegetarian ingredients. Checkout Pumpkin and Chicken Curry or Indian ‘Bolognaise’ with Noodles and Greens. If you are a meat eater use lean pork/chicken/turkey/seafood/varieties of fish/beef/lamb and game meats. 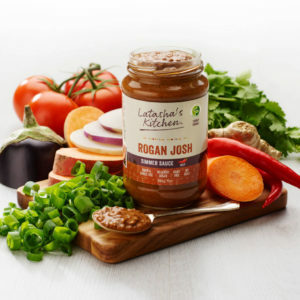 If not, experiment with firm tofu, tempeh and the allowances of nuts, nut butters/tahini and legumes serves. Try many of the vegetables on the list and try them raw where appropriate as well as cooked. Experiment with listed grains you may be unfamiliar with. Experiment with listed spices and herbs. Make double the quantity of the dish so you have some for a couple of lunches.